Feel free to dive into the wonderful offerings available to you on the internet. I have chosen a few and may continually add or revise this page as needed. As a reward for your diligence in diving in to study more, Mrs. Sampson offers Formative Extra Credit points. Consult Mrs. Sampson or the Calendar to find out how many Formative Points are available for Readings and Videos. This page may need revising from time to time as content creators may change/update location and/or content. Please advise Mrs. Sampson if a link is no longer connecting to it's proper location). Enjoy!! Overview of the Industrial Revolution – informative article on the events and consequences of the Industrial Revolution. Industrial Revolution Origins – beginnings of the Industrial Revolution are chronicled in this article. Industrial Revolution Resources – useful resources on the Industrial Revolution. Industrial Revolution – information on the various stages of the Industrial Revolution. Britain’s Industrial Revolution – outlining the role of Britain in the change in industry. American Industrial Revolution – information on how industry has changed in the United States. History of Labor – article outlining how labor has changed in the United States because of the Industrial Revolution. The Classroom - The Industrial Revolution - A comprehensive resource on the growth and effects of The Industrial Revolution. First Industrial Revolution – informative article on how the Industrial Revolution began. Second Industrial Revolution – information on how the Industrial Revolution of the 19th Century changed manufacturing. Industrial Revolution – brief overview of the changes resulting from the Industrial Revolution. Inventions of the Industrial Revolution – overview of the inventions that occurred during the Industrial Revolution. Role of Women – information on the changing role of women in industry. Child Labor – article outlining the use of children in the manufacturing and workplace. Labor History – information on how labor laws came into effect due to the Industrial Revolution and resulting changes. Impact of Industrial Revolution – outline of the results from the Industrial Revolution. Childhood Lost – article showing the effect of child labor on the families of the Industrial Revolution. Resources of the Industrial Revolution – useful collection of resources on the Industrial Revolution. Beginnings of the Industrial Revolution – interesting article on the start of the Industrial Revolution. Industrial Revolution – e-text of book on the Industrial Revolution. Links of the British Industrial Revolution – collection of resources on the British Industrial Revolution. Victorian Era Technology – information on the increasing technology of Victorian era Britain. Industrial Revolution Overview – useful collection of resources regarding the Industrial Revolution. History of Technology and Work – information on how technology and innovation changed the way industries functioned. History Timeline – information and a chronology of the events of the Industrial Revolution. History of Child Labor – article on how the Industrial Revolution changed labor. Industrial Revolution – effects of the Industrial Revolution on the textile industry. 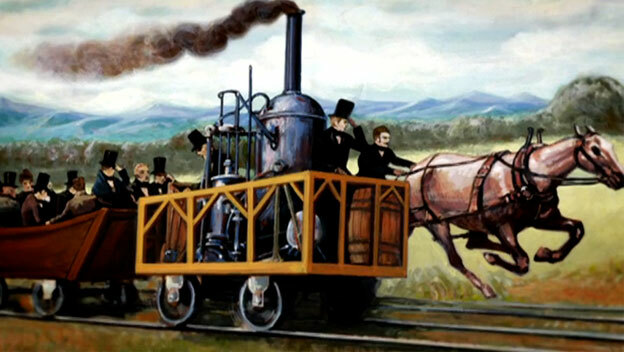 Transportation – article showing how transportation changed due to the Industrial Revolution. Industrial Revolution – helpful overview of the Industrial Revolution. Inventors and Inventions – information on inventions and inventors of the Industrial Revolution. Industrial Revolution – wiki article on the Industrial Revolution.